0.75ct White Zircon 1-1.5mm. This ring is Platinum over Fine Sterling Silver and is made up of the following. 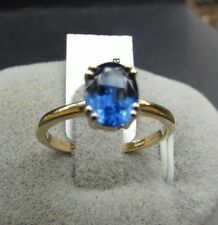 Lovely Genuine Himalayan Kyanite Solitaire Size 7 Ring in 10k Yellow Gold. This ring contains 1.82 g of 10k Yellow Gold. 1 - 1.62 cts Kyanite from Nepal. It is beneficial in negotiations, diplomatic missions, arbitration and other forms of communication between disharmonious people, allowing disparate energies to move into resonance and find a common frequency. 0.50ct White Zircon 1-1.7mm. This ring is Platinum over Fine Sterling Silver and is made up of the following. This intricate setting is hand engraved with a millgrane design. This setting is holding the Opal with six prongs. We can size this ring to fit you. 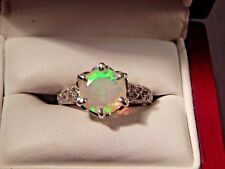 Round Multi Color Opal Filigree Sterling Silver Ring Hand Engraved. FINE, Rare, and HARD TO FIND NATURAL Beautiful COLOR CHANGE GARNET and Diamond 10K Yellow Gold RING. The ring is size 7, 1.75 gram of solid Yellow Gold, 3 oval cut Tanzanian Color Change Garnet 6x4 mm embellished with 6 small natural diamond 0.03 ct.
For your consideration, is a lovely Sterling Silver 1.67Ct. 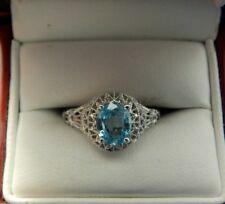 Oval Faceted Blue Zircon Filigree Ring. It is VS in clarity. The single shank filigree setting is 925 Sterling Silver and is hallmarked "925" inside the band. 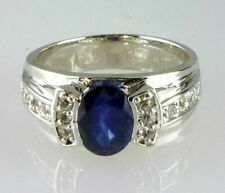 This is a very comfortable style and these sapphires are a beautiful dark blue color. Made of solid. 925 sterling silver. Sapphire, (1) 8x6mm oval, 1.50 carat. White Topaz, (12) 1.5mm rounds, . 02 carats each. This is a Beautiful, Bali Legacy Collection Ethiopian Opal Ring. 1.60ct Ethiopian Opal Cab 10x8mm. This ring is made of Fine Sterling Silver and is made up of the following Pictures don't do justice. 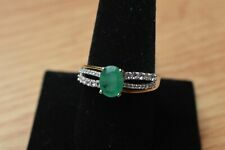 LIVELY, NATURAL EMERALD CAB IN SOLITAIRE SET 14K W GOLD RING SIZE 7.0-7.25! January -Garnet. Jade April - Diamond, Sapphire, Rock Crystal ,Opal. August - Sardonyx, Carnelian, Moonstone, Topaz, Peridot, Ruby. Sapphire, Diamond. Sept. - Chrysolite, Sapphire, Lapis Lazuli, Zircon. GENUINE 7.60 CT PERIDOT WITH WHITE SAPPHIRE ACCENTS AT. 14 CT IN A FINE DESIGNER RING IN STERLING SILVER. 925. THE DESIGN IN THIS RING IS VERY DESIGNER IN LOOKS. STERLING SILVER. 925. I HAVE BEEN MAKING RINGS FOR OVER 40 YEARS . 1=1.72ct Cabochon Cut Natural Opal. 14K White Gold Ring W/. This ring can be sized to fit you. This ring is a size 5.75. Total diamond weight appx: 0.04 Ct. Width at the top appx: 7.3 mm widest point. Color: H-I. Generations 1912 1.64ctw Blue Sapphire and Zircon Ring. "Generations 1912 has the look of a bygone age. Ranging from Victorian era influence through the periods of Art Deco and Art Nouveau to the 1940s, this collection creates new traditions that can be passed for generations. The two side stones are Ceylon Sapphires. 22 Ct. each.This is a strong and well made ring. This is a natural Opal in a sterling. Opal is a stone of inspiration which enhances imagination and creativity. Origin of Blue Tanzanite- Tanzania. This Beautiful Ring is made out of Solid14KT White Gold and Natural UntreatedBlue Tanzanite and it is one of the Most Sought After Classic Designs of all FineRing. Beautiful Ethiopian Welo Opal, 1.51CTS, Carefully Hand Set with. 93 ctw White Zircon, 18k Yellow Gold Over Sterling Silver Ring, Size 9, Striking Red Flash Multi-Color. See the product in action. Surrounded with round natural earth mind diamonds. 25ct VS- SI H in color.1.50 T.C.W. This ring can easily be sized up or down by inexperienced jeweler. Feel confident. $Women's 10k Solid Yellow Gold & Rose Gold Topaz & Diamond 3 Stone Ring Item Details: Metal Purity: 10k Solid Two Tone Gold Style: 3 Stone Ring Main Stone: 1) 6 x 8mm Topaz = 1.50ct Main Stone Color: Blue Main Stone Shape: Oval Cut Additional Stones: 2) 1.3mm Round Cut Dia monds = .02ct Total Carat Weight: 1.52cts Natural Stones: Yes, Natural Not Enhanced Ring Size: 8 (Sizable) Total Gram Weight: 2.9 grams Occasion: Any Brand: BB Made in: USA This gorgeous gemstone gold ring will make a great addition to your fine jewelry collection. These gems are natural and not enhanced in any way. 3 - (1.66Ct) –Round shape Csarite - (5.00 x 5.00) mm Origin – Turkey. About Csarite It is not a drastic change in color, but you will notice it anyway. OPAL WEIGHT: Approx 1.5 cwt combined. COLORS: Neon Red, Orange, Gold, Green, Blue, Yellow. 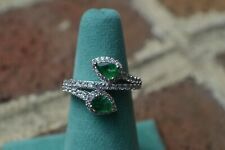 RING SIZE: USA Size 10 1/2 no resize available. Opal has Color but is Fairly Dull. Opal has Fair color but Nothing Special. 14k Rose Gold Diamond Blue Zircon Ring. set with 1=1.66ct Oval Cut Natural Blue Zircon. & 2=.07ct Round Cut Natural White Diamonds. This ring in size 6.25 and can be sized to fit you. Natural Center Oval Cut Dark Blue Sapphire.70cts. Natural Side Baguette Cut Dark Blue Sapphire.80cts. Color: Dark Blue Clarity: Clean. Natural Side Round Cut White Diamonds.04cts. Ring Size: 7. The 14K white gold pave halo setting is solid white gold and has clean gold detailing. Main Stone: Tanzanite. This certified cushion Tanzanite is 1.37 carat and has beautiful violetish blue color. We can not replicate the thousands of different light conditions in the indoor/outdoor world so we use the light that shows the color of the gemstone only. Natural Diamonds Weight: 0.33ct. Settings Gold Ring. Gemstone Gold Ring. Diamond Wedding Bands. New Arrival. Settings Gold Earrings. Settings Gold Pendant. Gemstone Gold Earrings. This is a gorgeous 1.48 carat Alexandrite ring with. 03 carats of diamond accent stones. Natural Orange Sapphires : 1.50cts. Color: Orange Clarity: Clean. Can This Ring Be Sized: (NO). Ring Size: 6. Warm water. PAT DRY ring box. Gently rub in your palms with a drop. Flower - 16mm X 14mm. 4mm wide band. IDEAL PURPLE COLOR. NATURAL EARTH MINED GEMSTONE. New ring intentionally oxidized. The Aquamarines have no inclusions visible to the naked eye with a bright blue-green color, and the diamonds are very bright, also flawless to the naked eye (SI) and white (G-H). This solid new ring weighs 3 grams total, sits 3/8" tall on the finger at the center Aqua (from the hand to the knuckle), is a size 6-6 1/2, and can be resized one size larger or smaller by your jeweler. This is a Beautiful, Rubellite Tourmaline / Chocolate Zircon Ring. 1.25ct Rubellite Tourmaline 4mm. 0.30ct Chocolate Zircon 1mm. This ring is 14K Yellow Gold Plated over Fine Sterling Silver. TCW is 1.65ct and is made up of the following. Natural Ruby. A Pigeon Blood tone. Current ring size: 6.25. yellow gold. H-color, Vs-2 clarity. 14k Solid Yellow Gold Natural diamond. Gold content : 14K. Diamond Weight: 0.36 carats. Diamond Clarity : Si1-Si2. For your consideration, a lovely 1.51ct 8.5mm Round Faceted Opal 925 Sterling Silver Filigree Ring. There is one 1.51ct. round natural faceted Ethiopian Opal solitaire. Hallmarked "925" inside the band. This Beautiful Simulated & Man Made Diamond Ring is made out of Solid925 Sterling Silver and Natural UntreatedBlue Tanzanite and it is one of the Most Sought After Classic Designs of all Fine Rings. Tanzanite Weight - 1.40 Carat. (2) Ring Redesign. Gold Weight (grams): 7.39g. 1) Ring Resizing. 6) Custom make your own ring. Carat Weight: 1.59ct. 4) Upgraded Diamonds (full cut, VS clarity or other). Service you wholeheartedly. The diamond on the bottom of the garnet is an accent. The ring has a band width of 1.8mm and is a size 6.5. It weighs 2.6 grams and is marked 14k. Side Diamond Carat Weight: 1.00. Side Diamond Cut Grade: Very Good. Side Diamond Color Grade: G - H. Side Diamond Clarity Grade: VS1 - VS2. Gold Weight: 4.8 grams. Center Stone Features Inquire within. Style: Diamond & Tanzanite Ring. Stone Type: Natural Tanzanite. Settings Gold Ring. Gemstone Gold Ring. Diamond Wedding Bands. CENTER STONE Natural Diamonds Weight: 0.48ct. Settings Gold Earrings.